I don't pay a whole lot of attention to the pens I use from day to day. Sometimes I grab for a FriXion pen if I think I'll be making mistakes, or a cheap ballpoint if I think I'm prone to forgetting it. I use a pencil on occasion, but more often than not I'll grab for my Sharpie pen. Today, on a lark, I grabbed a random pen from the back and wrote my notes with that, nothing special, just your standard Gel pen. I read the clip: "Zebra Sarasa 0.7" and thought to myself, that sounds cool, but isn't very memorable. Of course the next thing I needed to do was open the pen up and see what format the ink refill was and what kind of spring it used, and was shocked to see it reminded me an awful lot of the Pilot G2 that everybody loves. So I dug up a couple Pilot G2s from around the office (what office doesn't have them running around these days) and was surprised to see that the Sarasa refill would fit perfectly in the Pilot G2, but the G2 refill doesn't quite work in the Zebra Sarasa. 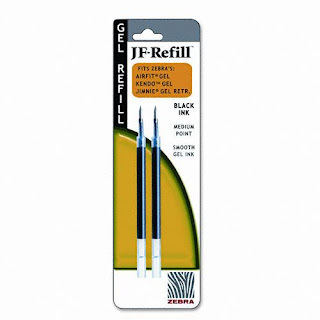 I checked some prices and it turns out that the Sarasa refill actually costs slightly more than G2 refill, so it doesn't work as an economical replacement. The Sarasa Refill doesn't have that funky yellow/orange waxy/pus thing, so that's a bonus. 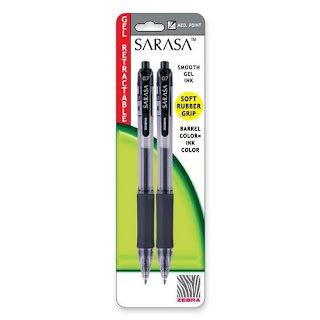 The Zebra Sarasa Pen is actually a little cheaper than Pilot G2 Pen so given the lifetime cost of either pen, they probably even out. When you first see the Zebra Sarasa next to the Pilot G2 it does look like Zebra was trying to imitate Pilot and did a poor job. The G2's clip is a little more organic, and the finger padding looks, but isn't actually, thicker. When you take each pen and actually write with them, they make almost exactly the same lines with the same thickness and same fluidity. The one thing I noticed was that the G2 has, for lack of a better term, amplified Desk Noise. When people test-drive cars they always talk about Road Noise (the unintentional noise that the wheels on the road make and how well you can hear it) and the pen-to-desk noise seems like a fair comparison. There must be something about the way that the G2 is constructed that allows the refill to rattle just enough in the casing that creates this, while the Sarasa must be built with just a fraction less space that doesn't allow as much rattle. 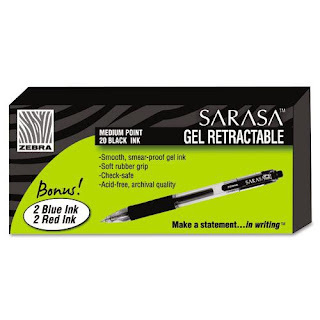 I'm a person with very small handwriting, and I find that Sarasa pens work much better for me than the G2. They skip much less (though G2 doesn't have a skip problem with larger writing), and I've never had a Sarasa pen just stop working on me, no matter how long I've left it without use. I have some G2 pens that dry up & quit on me if I don't use them regularly. @Amanda. My wife complains my handwriting is too small, but I've never had a problem with either pen skipping so it must not be as small as yours. With long term use I have also noticed that my G2s do tend to leave a large ink blob behind on occasion and I've never had that issue with a Sarasa. Ink blobs are fun and lend a really organic touch to art, but I don't need that on important paper work. Nice post!! Thanks for sharing.